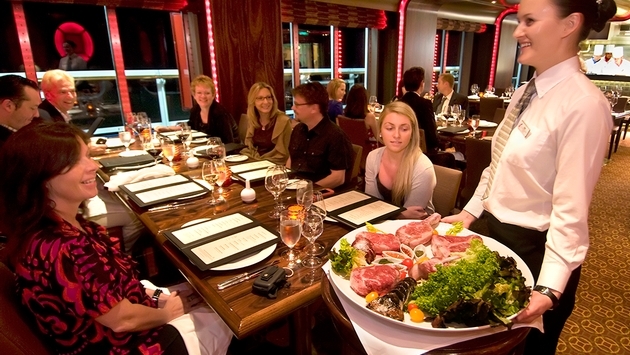 Carnival Cruise Lines is rolling out new for-fee “Steakhouse Selections” in its main dining rooms fleetwide. The roll-out began in late August after a “successful pilot program” on four ships starting in May, the cruise line said. The new steak and lobster entrées will be available for $20 each in the main dining rooms on all the ships. 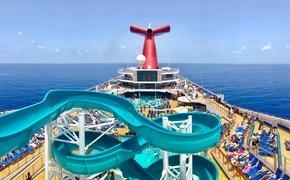 Currently, 13 Carnival ships have separate steak restaurants that levy a $35 service charge. Offered nightly, the “Steakhouse Selections” include a 1½-pound Maine lobster, 9-ounce filet mignon, 14-ounce New York strip steak, and surf-and-turf of broiled Maine lobster tail and filet mignon. The steak offerings are prime aged beef. The “Steakhouse Selections” seem to be aimed at those who want a premium beef or lobster dinner but don’t want to pay the $35 cover charge, prefer to stick to the main restaurant and their dining companions, or aren’t inclined to bring their kids to the steakhouse. (The $35 fee applies to children too). Royal Caribbean International has offered for-fee steak entrées in the main dining rooms for years. The selections from the Chops Grille specialty restaurant are a 10-ounce filet mignon for $14.95; a whole 1¼- to 1½-pound Maine lobster, served broiled, grilled or steamed, for $29.95; and both those selections in a surf-and-turf entrée for $37.50. A 15 percent gratuity is added. Royal Caribbean points out that guests can choose from 10 complimentary entrees every night in the main dining room, including a Black Angus top sirloin steak. Also, Maine lobster tail is a featured complimentary entrée item on select evenings on all seven-night or longer itineraries and five- and six-night itineraries sailing from Boston, New York and Baltimore. “Guests sailing aboard a Royal Caribbean ship that does not offer particular specialty restaurants or with family members and young children who do not wish to dine in a specialty restaurant have responded positively to having the option to enjoy a premium selection in the main dining room,” Royal Caribbean said in a statement.